You can close SBI maxgain account by re-paying the complete loan amount. 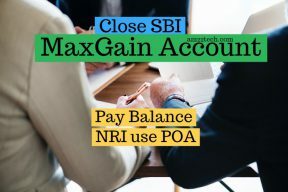 The Maxgain OD account is generally tagged to one of the SBI branch and this can be a completely different branch than the one sanctioned your home loan. The Gurgaon’s Sushant lok SBI branch can hold Maxgain OD account whereas the loan could have been sanctioned by SBI’s regional branch in Dundhera, Gurgaon. How can NRI close Maxgain Loan? If you are still in India and planning to leave soon:You would need to create a notarized Power of Attorney (registered POA is NOT required for bank matters). Prepare POA in favor of any friend or relative while you are still in India to close the home loan account on your behalf. This POA can be notarized by any notary within India. If you are NRI (Non Resident Indian) i.e. not physically present in India:The notarization (or attestation as commonly known) of power of attorney is done by Indian Embassy or consulate in your specific country. Visit the branch (holding your OD account) in person or send POA (Power of attorney) holder on your behalf.Carrying POA is important as SBI will keep a copy of the POA for records. Ask for the Maxgain home loan OD account closure form. If your monthly interest is due on 1st of every month, and you are closing Maxgain account on 10th, the interest between 1st to 10th is due immediately. Pay the remaining balance in your account by SBI cheque or cash i.e. Pending Interest for 10 days + the current outstanding loan.Giving out SBI Cheque is recommended as the clearing would happen immediately, else, you may have to visit the branch 1-2 days later to allow for some other bank’s Cheque clearance. Once account is paid out and closed, the branch will give you a letter specifying that Maxgain account has zero (0) balance.At this point the OD account would still show as an active account but with zero balance. Take this letter to the regional home loan branch of SBI (Like Dundahera Gurgaon branch in example case above) along with POA (if any).SBI branch will verify the letter and finally close your OD account along with terminating your monthly EMI’s deduction. If you do not get your EMI’s stopped here explicitly, SBI will keep charging it from your account and transferring the amount to this OD account. Please note that if EMI continues, your OD account would have positive balance but would NOT earn any interest whatsoever.